Acclaimed essayist Mark Edmundson reflects on his own rite of passage as a high school football player to get to larger truths about the ways America's Game shapes its men. Football teaches young men self-discipline and teamwork. But football celebrates violence. Football is a showcase for athletic beauty and physical excellence. But football damages young bodies and minds, sometimes permanently. Football inspires confidence and direction. But football instills cockiness, a false sense of superiority. The athlete is a noble figure with a proud lineage. The jock is America at its worst. When Mark Edmundson’s son began to play organized football, and proved to be very good at it, Edmundson had to come to terms with just what he thought about the game. Doing so took him back to his own childhood, when as a shy, soft boy growing up in a blue-collar Boston suburb in the sixties, he went out for the high school football team. 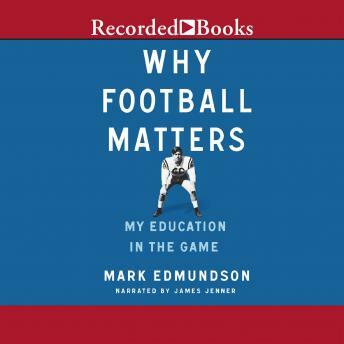 Why Football Matters is the story of what happened to Edmundson when he tried to make himself into a football player. What does it mean to be a football player? At first Edmundson was hapless on the field. He was an inept player and a bad teammate. But over time, he got over his fears and he got tougher. He learned to be a better player and came to feel a part of the team, during games but also on all sorts of escapades, not all of them savory. By playing football, Edmundson became what he and his father hoped he’d be, a tougher, stronger young man, better prepared for life.